We believe that most application developers should not worry about lower level platform primitives. Rather, they should focus on their application code. The recently announced Knative open source software project was created to simplify the application developer experience on top of Kubernetes by offering higher level primitives. Knative reduces the effort required to scale an application to the required capacity. It simplifies the ongoing deployment of new versions of an application, trivializes building source code by packaging it as an executable application within a container image, and advances event-driven application architectures. To encourage adoption of Knative and aid early evaluators of this open source project, we both collaborated to create Knctl – a command-line interface (CLI) that makes interacting with Knative simple. Our aim is to make development and deployment workflows easier than using kubectl for managing Knative resources. Knative goes a long way to help simplify the steps needed to use Kubernetes for deploying typical 12 factor applications. But it still requires developers to manipulate various YAML files through kubectl. While this workflow is usable, it is not as easy as it could be. More specifically, a Knative CLI would simplify developer experience and accelerate adoption of Knative. With knctl, we tried to capture what we think a more streamlined Knative experience might look like. One of the interesting design points of knctl is that it doesn’t prevent direct Kubernetes resources use. Users can fall back to kubectl if necessary. The following sections present an example deployment workflow. We start from a new Kubernetes cluster and deploy a sample application. Spin up a Kubernetes cluster (minimum required version is 1.10) on your favorite provider, and follow along. Next, install knctl by grabbing pre-built binaries from the Knctl releases page. On a MacOS X system, clicking on this link downloads the binary files into your home directory Download folder. You can run a quick check to verify that your Knative installation is operational by listing the Istio ingresses that Knative configures. On a fresh installation, there should be one ingress created. It might take a little bit of time for your provider to provision a load balancer, therefore the Addresses column might not be populated immediately. Revision: The revision resource is a point-in-time snapshot of the code and configuration for each modification that is made to the application. Revisions are immutable objects and can be retained for as long as they are useful. Every time an application is deployed, a new revision is created. 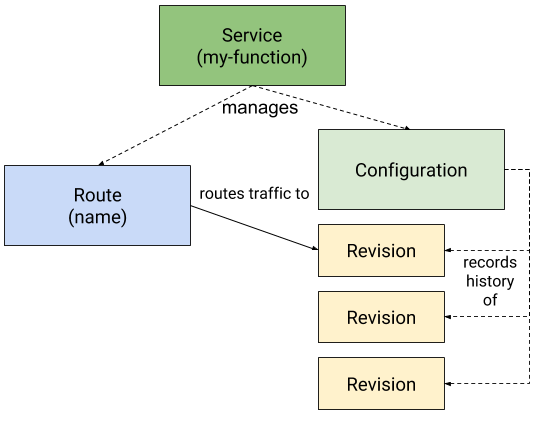 Route: The route resource maps a network endpoint to a one or more revisions. You can manage the traffic in several ways, including fractional traffic and named routes. By default, each service has one associated route. Service: The service resource holds associated revisions and routes (commonly one). Each application is represented as a service, as shown in the following diagram. Because you originally configured your application with the TARGET=Max environment variable, this sample application includes Max in its response. Note: Unless you have configured your DNS provider to point to the Knative ingress IP, you can’t use your browser to access your application. In the previous example, the curl command sends an explicit HTTP Host header when making a request. The HTTP Host header lets the ingress gateway decide which service you are trying to access. You can also see logs emitted by the application. It happens to log a line when it starts, and when it receives requests. The knctl logs -f command continues following application logs, until you stop it with Ctrl+C. hello-00001 > hello-00001-deployment-7d4b4c5cc-v6jvl | 2018/08/02 17:21:51 Hello world sample started. hello-00001 > hello-00001-deployment-7d4b4c5cc-v6jvl | 2018/08/02 17:22:04 Hello world received a request. By deploying the service again with the same name but different environment variable, Knative creates a revision of that service. Confirm the update by making another HTTP request. It might take a little bit of time for the change to take effect, as new pods start and traffic shifts. You can delete any deployed service using the knctl service delete --service hello command. This command deletes the service and all of its revisions. First, you deployed an application which Knative automatically started and assigned a route, so that it’s reachable. Next, you used knctl to observe several application aspects such as logs and pods. Then, you deployed an updated copy of this application and saw that a new version is actively running. You did all of these tasks without having to dig deep and understand how Knative manages custom Kubernetes resources! After you finish experimenting with Knative, you can uninstall it with the knctl uninstall command. (See the ASCII cast of the uninstall procedure.) This task takes a few minutes. The Knative and Istio system namespaces are removed. However, any Knative resources that you have not deleted beforehand remain (such as hello service). You can also delete the Knctl executable with rm /usr/local/bin/knctl. Our immediate next step for Knctl is to collect feedback about the CLI user experience. We would also love to hear your feedback on features that should be our next priority, for example Knative Eventing commands or support for traffic splitting. We are also working closely with the Knative community to push for wide adoption of Knctl, hopefully as the standard CLI for Knative. Knctl streamlines application developer and deployment workflows for using Knative and Kubernetes by exposing a curated set of commands. Then developers can focus on their code, and rely on Knative to do application management behind the scenes. In combination, Knctl – with Knative on top of Kubernetes – can be a powerful and friendly way to deploy your applications without losing access to raw Kubernetes APIs. If you’re interested in more advanced features, like deploying apps from source, splitting traffic across revisions, and connecting Knative services to databases, see Part 2 of our blog series about Knctl. We welcome your feedback through our Github project and look forward to your pull requests. Our goal is to keep knctl in sync with releases of Knative and test it on various leading Kubernetes cluster providers.